^ possibly...I can see in the future them expanding Tomorrowland, or Adventureland to be more Boy Specific in the near future , but this could be a step. I can't even begin to imagine what they are thinking with this. I don't think my kids even know (or care) what the name of the carrousel is, now, even though they ride it almost every time we go. ETA - if it's the "boy angle" they are after, (which is the only thing that remotely makes sense,) then this is even more of an epic fail. Prince Charming invites one and all to test their horsemanship skills and to enjoy their own happy ending. Come on...no way that wasn't intentional. I love enjoying a happy ending, maybe the girls will get the She Bop ride! cfc wrote: I guess my only response is "OK, but does a carousel really need a backstory?" Chuck, sewer drains require backstory at Disney. LOL. Yeah, I've heard that the bus system is actually made up of vehicles that used to be in a sci-fi death race from some alternate universe; which is why they've had so many accidents over the last year or so. I'm also awaiting a new spin on the parking trams too. I just rode the Summer Nightastic overlay for WDW's Tower. I will say now, I'm going to go blow by blow for the whole experience (for a reason I'll get to) so if you want to be surprised, gloss over or plug your ears and eyes and go "LALALALALA" for a while. The beginning walk up is about the same. The music is much clearer and the lobby looks great. Not much different here. In the Library, the lightning and lighting effects were far more drastic, complete with the window in great sync. Then the fun really began. They totally reworked the sound and lighting design in load, making the load station even darker than it was and that boiler room really creepy. Like "Freddy's going to leap out and kill me" creepy. The sounds of a disembodied child laughing and the faint sounds of a really massive storm outside didn't help. Then it happened. What's "it"? Well, at what seemed to be pretty random intervals, all the generators for the service elevators stopped and then a loud "bzzap" signaled all of the lights (except for the ones directly over the load for what I can only think safety reasons) went dead for about 3-4 seconds. I'll admit, that did startle me for a moment, a definite noticeable change if you are in that "I know what's going on" mode. We piled into the service elevator and things began. The shaft is significantly darker with some different audio playing on the way up (you'll see that's a theme). Then the doors open to the hallway, as normal. The lightning struck outside the window and a blinding flash happens in the room. Ooooook. Thematic, or so I thought. Everything works as before, looks the same, the star-field looks great, doors close. Now here comes the big one. The doors open up again to...a star-field. Yep. No 4th dimension room. The elevator lurches forward, as usual, down the star-field hallway. The windows and walls on both sides have been covered up by a very obvious black curtain with stars and the hallway is eerily silent, from what I remember. And that's the best way to describe it. It's a hallway and feels like nothing more than that. Then, as the elevator centers itself, the end of the hallway changes to show...a mirror. Everyone who knows their Tower of Terrors knows where this is going. Yes, it is the exact same effect from the California/Tokyo/Paris versions of Tower, just this one is with a still image taken of the elevator car (note the flash from before). As the elevator continues through the door to the drop shaft, there is a very cool effect of the sound of broken glass (or mirror) and then 1930s era music playing over the Rod Serling narration. Playing over it enough that you can barely hear it anymore, to make it you plowed through the mirror and back into the night that the original 5 got zapped into the Twilight Zone. The drop sequence was air-time filled, but there wasn't anything that was overwhelmingly different to my memory. By that time, I had already face-palmed due to the loss of the 4th dimension room. For some reason, this really irked me. I know the current plan is to homogenize the experience with the Disney Parks with the "One Disney" plan, ensuring that a guest will experience the same experience no matter what Disney Park they go to, but that is achieved by sacrificing the identities of the individual parks themselves. I know the first draw of "it's Disney" doesn't matter what park you go to, but there has to be something else to draw guests to a certain property. If you make it all the same, then why would a guest from CA want to come to WDW? It's segmenting your audience by providing identical experiences to each coast, a process which may hurt in the long run. It's also with every change, WDW feels more and more like the red headed stepchild. I'm very proud of WDW, for obvious reasons, and it really hurts me to see it's identity slowly being pushed aside and the things that make it unique being turned into everything else. If I was in California, I'd feel the same way about DL, I'm sure. I walked out of the Tower, these thoughts running through my head and feeling generally disappointed and let down. Luckily, it's only temporary. I apologize if this turned a little ranty. I'm a nerd (obviously, I'm here) and I think about this stuff. Great Review, and by great review I mean the thoroughness, depth, and detail of your coverage not the content itself. Thats very disappointing to me to lose the 4th dimension room, albeit it temporarily. That was always what made Tower so unique and intriguing to me. Ive had that same feeling of general disappointed and let down with a lot of the new attractions Disney has put out lately specifically the space mountain overhaul, or lack there of. I feel the same way you do about the homogenization of the park experience from west coast to east coast and the whole One Disney thing, but its funny to me that while that is going on stateside the foreign parks are getting more and more unique. A customized version of Fantasmic, unique storyline for tower of terror at TDS, Grizzly Trail and Mystic Point in Hong Kong, Crush Coaster and Toy Story Play land in Paris with (still rumored) Ratatouille dark ride on the way (hopefully). But in America there is 2 Toy Story Mania's 2 Little mermaids, 2 Soarin's, etc. Yeah I know Everest and World of Color are unique new additions but those two parks desperately needed something unique. Im all for having the same basic and universally recognizable attractions at each park (Pirates, Small World, Space Mountain, Tower of Terror, Splash Mtn), but I also like each park to have its own unique identity, I guess I'm ranting a bit now too (Im a nerd also) but anyways nice review. jackskellington101 wrote: Then, as the elevator centers itself, the end of the hallway changes to show...a mirror. Yes, it is the exact same effect from the California/Tokyo/Paris versions of Tower, just this one is with a still image taken of the elevator car (note the flash from before). Baby, I'm howlin' for you. Walt Disney World has obtained a $15 million building permit to construct the Journey of the Little Mermaid, the Little Mermaid-themed dark ride at the center of the Magic Kingdom’s sweeping Fantasyland expansion. The permit, which was issued by the Reedy Creek Improvement District in early March, covers design and construction work. Reedy Creek puts the value of the work covered by the permit at $15.4 million. The district has also issued at least two other permits related to the Little Mermaid ride, one for a backstage employee sidewalk and another to relocate existing lighting. Among other Fantasyland-related permits that District has issued so far are permits to disconnect mechanical, electrical and plumbing infrastructure at Ariel’s Grotto (which will become the site of a Beauty and the Beast-themed area); demolish the Scuttle’s Landing eatery; and remove a backstage maintenance shed in the area of the former 20,000 Leagues Under the Sea attraction. The expanded Fantasyland is scheduled to open in phases beginning in 2012. With the Fantasyland construction having begun in earnest, building activity at Reedy Creek is mushrooming. The district says it permitted projects with a combined construction value of $23.2 million in March 2010, up 192 percent from the same month last year. Meanwhile, the number of building permits issued rose 24 percent in April and 4 percent in May. (Details on total number of permits issued for March and construction valuation for April or May weren’t immediately available.) Other recent big-ticket permits issued by Reedy Creek include one to redo the Mexican cantina restaurant in Epcot (valued at $4.8 million), another to rehab the façade of the Expo Hall in the Magic Kingdom ($1.6 million) and another for an exterior remodeling at the Days of Christmas shop at Downtown Disney ($700,000). Well it seems like they are getting some work done. I recently visited the park, yesterday, and wow what a difference. I was there a little over a week ago and I saw the walls and it looked pretty normal, but as of a few days ago...there are bulldozers and dirt mounds behind those walls. You can now see Toon Town from pretty much anywhere...dumbo, Pooh's ride, Mrs. Teapots...it's weird to actually see the whole area open like that. They have eliminated the berm and all those plants blocking it, and it was quite a unique feeling...never had it so open in the Kingdom like that (that I've seen). I can't wait to see all the new lands...when ever it is all completed. Just as scores of you had hoped – we’re leaving the lights on and extending Disney’s “Main Street Electrical Parade” at Walt Disney World. 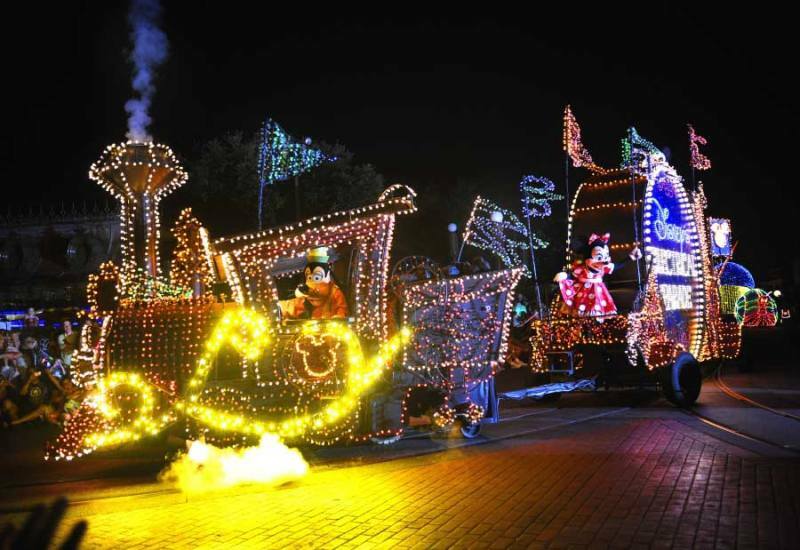 By popular demand, the parade at Magic Kingdom Park will continue an open-ended run when “Summer Nightastic!” ends on August 14. •Tinker Bell leads the eye-filling procession, waving from the basket of a balloon floating gracefully above a magical garden shimmering in fairy light. •Pinocchio and the boys from the classic film’s Pleasure Island sequence join the parade, and Snow White joins the Seven Dwarfs on a diamond mine float. 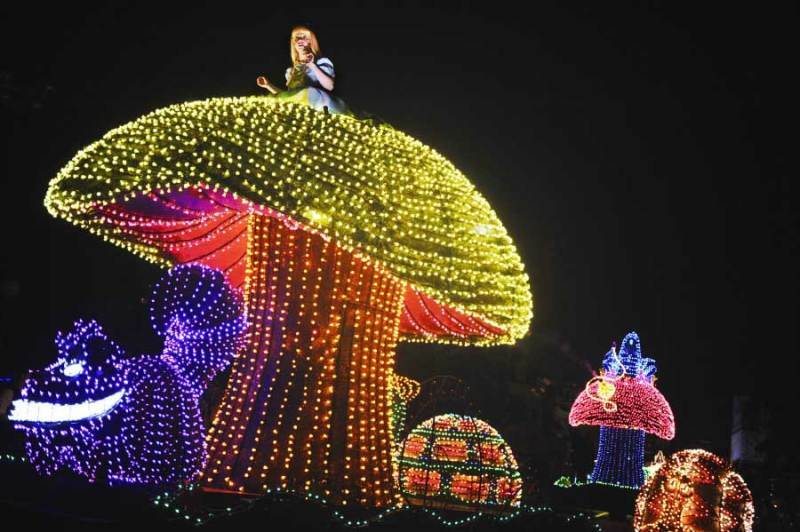 •There are new lighting effects, and the parade’s highly recognizable musical theme is brightened by new technology. Will you take advantage of the extended run? Let us know in the comments.